Demystifying 'shrubbing,' the newest trend in cocktail mixology. Shrubbing, the newest trend in cocktail mixology, is quickly winning the hearts of Saratoga’s bartenders, bar-goers and bar-raisers. No longer will we have to settle for un-vinegared ports and punches; our drinks will be forever flavored with pineapple allspice and apple nutmeg. Making a splash in martini glasses from New Orleans to New York is Shrub District, a white vinegar-based fruit syrup developed by Don Morton of Washington, D.C. Morton met representatives from Saratoga’s The Savory Pantry at the 2017 Good Food Awards in San Francisco, and has sold his products in the store on Broadway since this summer. Morton finally made it up to the Spa City in late October for two days of shrubbing cocktail mixers at The Savory Pantry. The shrub master was on hand to discuss his product, offer samples and instruct attendees on how to use his shrubs. “Stories all start with taste,” Morton said. “And alcohol,” Tas Steiner, The Savory Pantry public relations specialist, interjected. 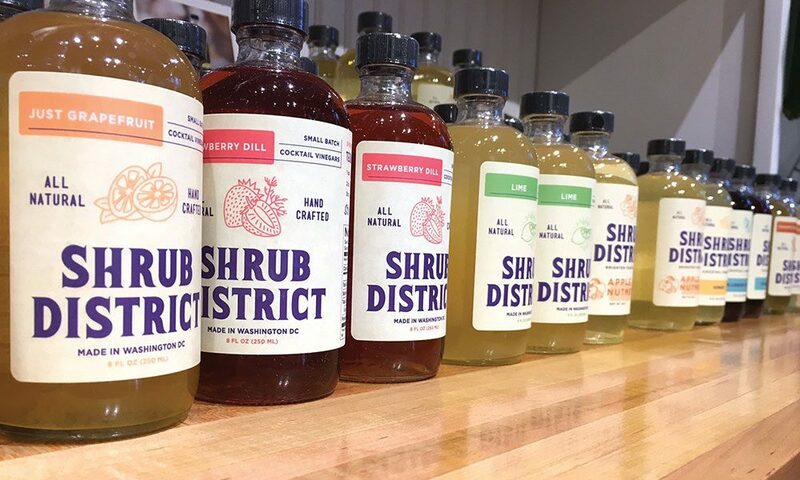 If this is true, Shrub District is the mother of all story starters — it brings delicious fruity flavors to your favorite type of alcohol. Morton came to shrubbing — a practice used by farmers to preserve excess fruit before refrigeration was around — after 10 years of public-policy work to bring back manufacturing jobs. His passion has always been wine, spirits and drinks education, and upon seeing the opportunity to create jobs by pursuing his passion, formed Shrub District. So far, he jokes, he has created 2.5 jobs, including his. Though Shrub District is advertised for its use in sodas, salad dressings, flavored meats and flavored sparkling waters, Morton’s focus is on cocktails. Shrubs replace the typical acid in a cocktail — like lemon juice. They enhance the acid component, by giving it a more complex flavor — like strawberry dill. The shrubs themselves are two parts acid or sour, one part sweet. Most Shrub District shrubs are a blend of a fruit and a spice, though some flavors stand alone, like just grapefruit and ginger. The flavors are produced on a seasonal basis, based on what fruits and spices are in-season. And they’re not vinegar-y tasting. They’re delicious. The Savory Pantry cocktail mixer featured punch used Morton’s blueberry basil shrub in tandem with Tullia Prosecco, Stonecutter Spirits Jingle Barrel Gin and Saratoga Sparkling Water. The concoction was light peach in color and had the fruity taste of sangria, with a pleasant kick. Other cocktails were available, cooked up by Tom Madarasz of Stonecutter Spirits, a specialty craft distillery in Middlebury, Vt. One was the Lone Wolf Stonecutter Spirits gin or whiskey, Shrub District ginger shrub, Pimm’s, apple cider and soda. And no Savory Pantry event would be complete without breads, spreads and oils. Guests moseyed through the store, sampling a brie-stuffed crescent roll spread, white pumpkin and almond murabba in a ricotta cheese, and cheese and jam-topped crackers. The afternoon was perfect: good food, great company and a lesson in vinegar wielding. And the rain dribbling down outside? We just shrubbed it off.